Date: Feb 22 2019, 3:30 p.m. - 6 p.m. 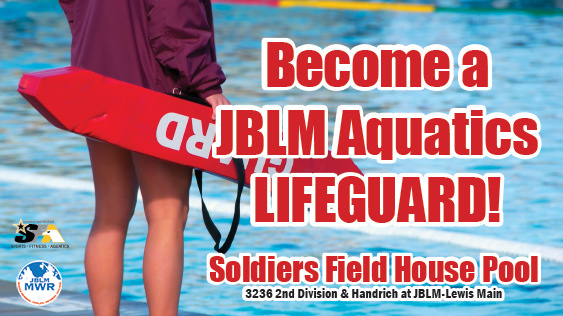 Attend the JBLM Aquatics Lifeguard Hiring Fair Friday, from 3:30 to 6 p.m. at Soldiers Field House Pool. Ages 15 & up. Interested individuals should bring a resume, copy of certifications and swimsuit for the pretest at the Hiring Fair. CPAC will be on-site with tentative job offers for qualified candidates. Pay ranges from $13.50–$16 per hour. Need to get certified? Attend the Lifeguard Class to prequalify. For questions, call the JBLM Aquatics Office at 253-967-5390. The pool is located at 3236 2nd Division & Handrich at Lewis Main. Questions should be directed to 253-967-5390 weekdays.